Found to be cold hardy to 25 F in Walnut Creek. Below that, foliage damage or death will occur. When hybridized with C. microspadix, the cold tolerance may be below 14 F, but severe foliage damage will occur. 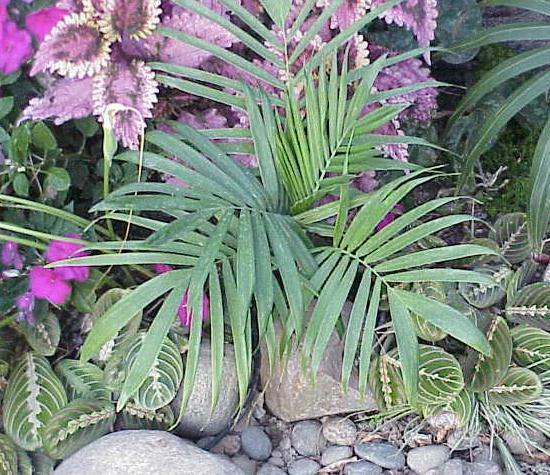 It's a small palm that generally does well in the bay area and will grow in zones 14-17 (Sunset). C. oreophila is a rather curious plant and differs from most Chams. as it sends out multiple bloom spikes from the same node on the trunk. Most only send out one. It also has beautiful orange/red fruit which will remain on the plant for a long time before they fall off. The male plant has attractive cream/yellow "catkins" that hang down and for a male plant is quite attractive.